Enzo Mari is legend amongst furniture designers -- a cranky old radical, chewing over cigars and long Italian syllables as he lacerates the current state of design. Now 85, according to the Wikipedias, he is still best known for his 1974 book Autoprogettazione ?, a DIY instruction manual detailing 19 simple pieces of furniture. Setting out harsh constraints for himself, Mari used only common dimensional lumber fastened with nails, avoiding cuts, joinery, and finishes. The results are severe in form, stripped to an irreducible degree (much like the zip-tie). Pre-internet, Mari then released the designs as a simple, (initially free) book instead of as actual products, in the hope that folks would learn about carpentry, design, and the expression of quality through the process of building. Tavolo rettangolare (rectangular table), via Apartment Therapy. All the tables in the book are named tavolo rettangolare , as if even giving them names was too much artifice. "The quality-quantity ratio is central to the whole of industrial production: quality is determined when the shape of a product does not 'seem' but simply 'is'. This statement, anything but a paradox, is not understood by most people. And this makes it difficult to execute projects of real worth . . . 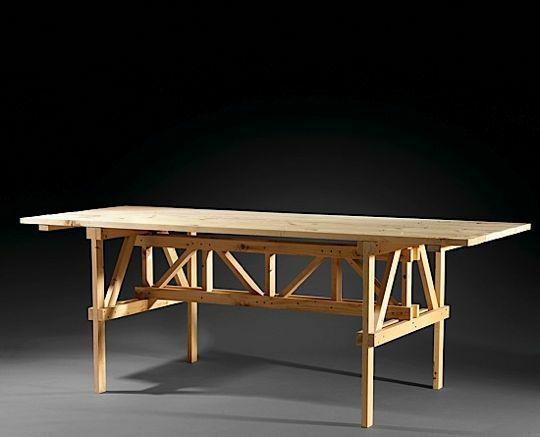 In 1974, I thought that if people were encouraged to build a table with their own hands, for example, they would be able to understand the thinking behind it. The "design" has also been stripped from the book itself, just typewriter font, black-and-white drawings, and a spiral binding. A wink, a beard, a tired rubbing of the face, a subtle f-you . . .
A radical text, an opinionated designer, a soap-box just tall enough to get its occupant into trouble: Autoprogettazione? has all the makings of a durable design meme. Perhaps predictably, it has slipped quietly into the canon, subject of scholarly books, retrospective videos, and inevitable hipster co-option. But then again, it is also still serving its original purpose. The other day, researching makerspaces for my day job, I came across the website for 3rd Ward Philly, and recognized the furniture in all the pictures. Mari himself continues to throw grenades, calling Rem Koolhaas (who was in the audience at the time) a "pornographic window dresser" at a lecture a few years back. Back then, Mari was engaged in a practice that was far more radical then it is now: subverting the traditional means of production by giving away his designs. Though in his mind he may have been fulfilling a Marxist goal -- putting the means of production back into the hands of the individual -- his work is, in my mind, democratic with a small "d", more Jeffersonian than socialist. He recognized the disruptive power of distributing the instructions to make the thing instead of the thing itself far before MakerBot, Instructables, and all the other innovations made possible by the Creative Commons copyright license. We should all be so lucky, still able to work and make waves late into life. But we should also keep the fundamentals in mind: it's about the work, not the designer . We are so cult-ish about our design culture these days, watching TedTalks and reading about starchitects, that we forget that praise was once a by-product of one's intellectual rigor and purity of form. If you have a few minutes, please watch the video below -- it's much better to hear the roar from the mouth of the lion instead of my tinny echo.